HUNTINGTON, W.Va. – Three artists with Marshall University connections – two faculty members and an M.A. graduate – were among those who won awards in the biennial West Virginia Juried Exhibition this year, sponsored by the West Virginia Division of Culture and History. West Virginia artists were presented with 18 awards totaling $33,000 in a ceremony earlier this month at Oglebay Institute’s Stifel Fine Arts Center in Wheeling. The exhibit features 72 works in the areas of painting, sculpture, printmaking, drawing, photography, mixed media and crafts by 60 artists from 23 West Virginia counties. Daniel Kaufmann, assistant professor of photography in Marshall’s College of Fine Arts, received a Governor’s Award for Rooms 13. 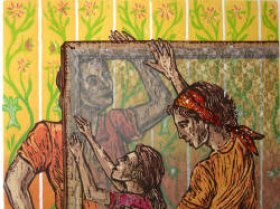 Graphic design professor Mary Grassell won an Award of Excellence for her wood block print titled The Lace Stretchers, which depicts the artist and her sister helping their mother stretch lace curtains. Filter Feeders, a piece by recent M.A. graduate Nik Botkin, received the Merit Award, which had a $500 prize attached.